The Arctic Blast Professional Misting Fans are the most effective cooling devices we offer! 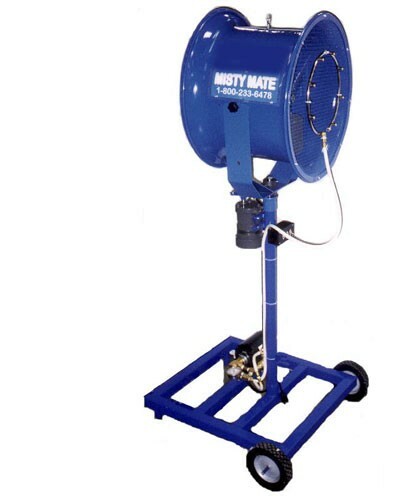 A High Pressure (800 - 1000 PSI) Misting system combined with a Fan. We made these High Pressure Misting Fans originally for the NFL's Arizona Cardinals who used them on the sidelines during their football games to cool down their players and help prevent heat exhaustion. These types of systems are still being used by several professional athletes and teams today. If you're hosting an event outdoors this summer , this is the ultimate cooling machine e to keep everyone cool and comfortable! Due to the high pressure (800 - 1000 psi), the mist is more like a fog of moisture, circulated with a high powered fan for the ultimate cooling experience! • Specifications: 3800 CFM, 115 Volts, 5.1 Amps, 140 lbs. • Runs off of 110v, Needs a water inlet with a Minimum Pressure of 40psi. Note: Ships on a pallet by way of an LTL. Additional shipping Charges will apply.